Katz Castle, formerly called Neu-Katzenelnbogen, was built in the 14th century on a rock next to the famous Loreley rock. 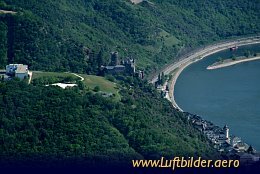 It was erected to protect Rheinfels Castle. The Castle was blown up by Napoleons troups and remained as a ruin until it became reconstructed in the 20th century.